Life happens. We can’t all afford to wait till our next appointment to see our dentist. This is especially true in the case of accidents and injuries. That is why it is good to know that the skilled and caring professionals at Lakeview Dental are here for you when you need them. For patients that need to see a dentist as soon as possible, Lake View Dental provides all patients with emergency dentist services. When you need help fast, trust the emergency dentist services at Lakeview Dental. At Lakeview Dental we will do everything in our power to treat you as quickly as possible and get you back to enjoying life again. 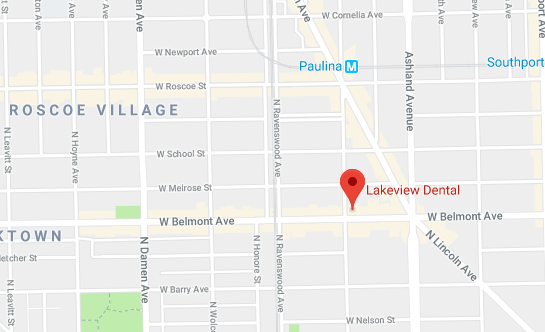 Our office is conveniently located at the intersection of Belmont and Paulina Avenue in the Lake View Chicago neighborhood and offers complete emergency dentistry services to all ages. We use the latest technologies such as digital x-rays to minimize treatment times. Our extraordinary office facilities also allow our patients to experience unmatched comfort and amenities not available at other emergency dentist offices. Advanced technology to provide a quick diagnosis and treatment of all dental procedures. We pride ourselves on offering expedited dental care as well as going above and beyond for our patients. Whether you are looking for an emergency dentist, cosmetic dentistry, a general dentist, sedation dentistry, or Invisalign® services in the Lake View and Roscoe Village area, we can provide you with the care you need. It is our mission to make you feel at home when visiting us. We are dedicated to providing the highest level of care and service to every member of your family. Contact us today to experience the Lakeview Dental difference!